If you struggle to get your picky eaters to eat their veggies, then you need to try these 16 Healthy Cauliflower Recipes: Easy Healthy Recipes for Every Occasion. You and your family will love these cauliflower recipes because they're all so amazing. On this page, you'll find cauliflower side dish recipes, cauliflower dinner recipes, and cauliflower soup recipes. Although these recipe all use cauliflower, you won't ever get sick of the healthy veggie. Cauliflower acts as the base for these healthy recipes, and the veggie works perfectly because it complements almost every flavor and ingredient. Cauliflower is delicious in just about everything, but it's especially delicious in these 16 healthy recipes. If you like these cauliflower recipes, then you'll love these 23 Easy Broccoli Recipes. These cauliflower soup recipes will warm you up from the inside out. You'll love how creamy and flavorful these soup recipes are. The best news is that none of these recipes use canned soup, so you'll know exactly what goes into your bowl. You are going to fall in love with these easy soup recipes. Dinner isn't the same if you don't have a delicious side dish recipe to complement the main dish. These healthy cauliflower recipes are sure to become family-favorite recipes. Your family will beg you to make these recipes over and over again. Luckily, you'll love these side dish recipes, too. So, you won't mind too much. Want even more healthy recipes? Check out these 26 Low Carb Recipes. Although these may not be the most traditional dinner recipes, you'll be so happy when you make them for yourself. These healthy dinner recipes are all so amazing. These cauliflower dishes will leave you feeling full and satisfied. There's not much better than these cauliflower recipes. I love cauliflower, but I do make it the same way every time. I'm excited to find new ways to cook one of the few veggies I actually like! I'll think I'll start with the soup recipes. You know, I've never been that into cauliflower, but I never knew there were so many options of what to do with them. Maybe I'll give them another try. 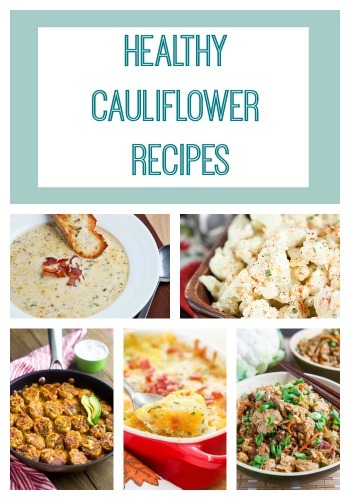 I love to cook with cauliflower, so I definitely give these recipes a try.